If you need a little help reaching with the toilet paper, then you may have found yourself in the market for a toilet tissue aid. There are a lot of different brands on the market, so it may be difficult to figure out which one is going to offer you the most help getting to those hard to reach areas. While these aids are simple and relatively affordable, we still wanted to take a closer look and assist people with the buying process to make sure you get what you are looking for. We have taken a closer look at three of the best toilet tissue aid products. While we do like the Juvo Products Self-Assist Toilet Aid the best as a small and simple aid, there are a few others that you may also be interested in which we review in detail below, including the popular Freedom Wand that has a longer handle and can be used to grasp other personal bathroom items (see video and review below). These self-aid or self-wipe accessories may seem unusual or unnecessary to someone that has never needed one but are gaining popularity among seniors, heavy persons or anyone with mobility issues that has trouble reaching their backside by themselves. These hygiene aids help give people independence and privacy rather than having a home health care assistant or loved one need to assist them with going to the toilet. 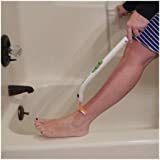 The Freedom Wand is a personal hygiene tool that it can also be used for several other items like holding toilet tissue, shower loofah or even for help shaving in the shower. So if you are looking for a personal aid that goes beyond just using it for toilet paper, you may want to consider the freedom wand. This toilet aid by Juvo is a great choice if you are looking for an easy to use design. It gives you an added range of motion when cleaning up after going to the bathroom. It offers the ability to reach in from either the front or back which makes it a good match for almost any user. The wand’s handle has the release trigger conveniently places to easily release the used tissue into the bowl without having to lift it back out. While it may take a little getting used to in the beginning, after a few tries the user should be able to easily do this on their own. There are actually two release triggers, one on the front and another on the back of the handle which gives the user the option to press the one that’s more convenient, depending on how they are holding the handle. One other nice option is that the Juvo toilet aid can be bought individually or as a set with a storage caddy- which helps keep thing more hygienic. Let’s see what else this self-aid tool from Juvo has to offer. The handle has the ability to be used from the front or the back, giving you some added versatility and freedom with it. It effectively holds your toilet tissue where you need it to be, making cleaning up after the bathroom easier on you. There is a trigger on the handle that helps to lock the tissue holder, but you can release it easily by pressing the release button. This helps for easy clean up afterward. There is a bit of a learning curve to it, so don’t get too frustrated when it may not be as easy to use as you would like for it to be at first. Some people say that it could be a little bit longer, to give just a little added reach. Next up, we have the Bottom Buddy. This is a product that is manufactured by Hygien’ease Technologies. Their main goal is to make hygiene in the bathroom a little easier on people who need some added range of motion. It also has some other key features. This one also locks the tissue in place and has an easy to release the trigger that drops the tissue into the toilet when you are ready. The handle is 11 inches long and is effectively curved to help you get better motion with your reach. There is a pouch that allows you to carry it with you on the go because sometimes we have to go to the bathroom away from home. Stay clean and hygienic even when you aren’t home. Some consumers say that they only get a few months of use out of their Bottom Buddy before they have to replace it. It may be a better idea to get more than one rather than try to use the carrying pouch. If you plan to carry it around, you will have to clean it each and every time you use it. At first glance, these may look much like your ordinary kitchen tongs, but these are a little different. They are curved, allowing you to reach areas you may be unable to reach otherwise. Some people really love the tong style, simply because it is easy to use. The tongs make it really easy for you to reach the toilet paper, while also keeping it in place to wipe. Just get a bit of an extended reach with this helpful tool. It isn’t really heavy, and there is less of a learning curve with this one. It may be easier than some of the other toilet tissue aids out there. The handles are coated in vinyl, making it easy for you to grip. It is also pretty easy to keep clean, as it also has a stainless steel design. If the toilet paper gets too wet, it can be kind of difficult to release it from the tongs afterward. The tongs have a slight bend, but they are really not that curved. This can make it a little harder for you to reach harder to reach areas. As you shop around, you will find that there are so many different styles to choose from. First, consider the particular style that you are looking for. There are some that actually look more like tongs, and others that have more of a wand style. Both of them can be quite useful, and this is really just a matter of preference. Length: What you will use it for: if you are just using it for toilet tissue you may be fine with a simple, shorter model. If you want to use it for other things in the bathroom (for example reaching toes with clipper) you may want to consider a longer handled hygiene aid. Quality Materials: Next, you should consider the material that it is made out of. Toilet aids have a tendency to get messy sometimes, and they must be cleaned regularly. Having a material that is easy to clean is really a good idea because it can be beneficial when it comes time to clean it. Another feature to look for is one touch tissue release. Releasing the dirty tissue is not something that you want to be difficult. When using tongs, it is easy to open them and release the tissue. Others have a button that you push. Just make sure that you find one that will be easy to release after use. Trust us on this one. Finally, think about the portability of the product. Some of the toilet tissue aids will have a carrying pouch that makes it easy for you to take it on the go. This can be an added plus. I follow these guys online, they have some great videos on Physical Therapy and lots of great stretching and rehab exercises. This video is an informative look at why you might want to consider a toilet tissue and some key things to look at when purchasing a self-wipe aid. They are reviewing the best selling “Freedom Wand” (click to check price on Amazon). The truth is that there are several different toilet tissue aid wands for you to choose from. While we really did like the Juvo Products Self-Assist Toilet Aid best, you may really like any of the products that we featured. The Juvo is just ideal in our eyes because it is so easy to use, and easy to keep clean. It is also pretty affordable, so you can get a spare if you need it. Consider this toilet tissue aid or one of the others that we mentioned.